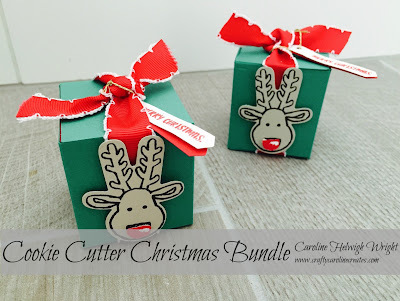 CraftyCarolineCreates: Cookie Cutter Christmas Surprise Gift Box - Video Tutorial using Stampin' Up Products. Cookie Cutter Christmas Surprise Gift Box - Video Tutorial using Stampin' Up Products. 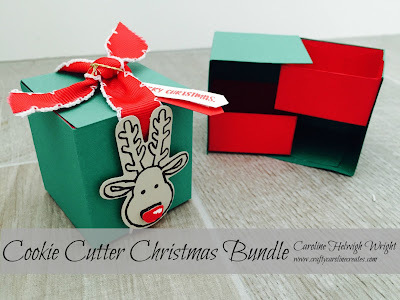 I just love this box, I've been wanting to share it with you ever since I made it, in fact it was scheduled to be shared in a few weeks but I love it so much I moved it up the list! It is a really cute little gift box which gets even more special when you open it up! The two little trays make for an extra surprise. I've not used the Stampin' Up Markers a lot before - I've only had a few colours and always forget about them when I'm creating. 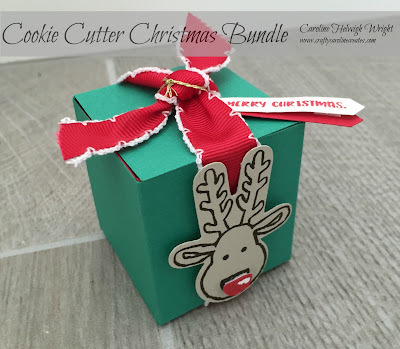 I was looking for a nice sentiment for the tag on this box and noticed the Merry Christmas word hidden amoung a longer sentiment in the Cookie Cutter Christmas set and had a light bulb moment to use a marker to pick out just those words. It is great that SU are now selling little packs of two markers so you can have some useful colours on hand without investing in the full set. And before I share the video so you can see exactly how this box was made - let's take a minute to admire that gorgeous ribbon.............................................................................................................................................................................so beautiful! Ok - so the video tutorial is HERE, I hope you enjoy it. Very cute and I love the real red with the emerald green.